OnlineBlackjackRewards.com > What Are the Odds Like in Online Blackjack? In equations of blackjack odds and probability, online casino players need to take note of the differences among blackjack tables online first. Winning at blackjack has a lot to do with both simply choices and advanced strategies. The very first choice that you make should revolve around which table you should play at. As a matter of fact, your location of playing is just as vital as how the game gets played overall. The payout in blackjack is 6:5. In games with classic blackjack odds, "naturals" pay out 3:2. While 6:5 may look better, the setup actually pays less. If you only see 6:5 tables, try to find one that offers one that offers up 3:2 elsewhere. Dealers hit on a soft 17. With this rule, the casino edge improves as the dealer will have another chance of beating player hands with 18 or up. Although this advantage isn't as egregious as the 6:5 blackjacks, the house edge will still increase by around 0.22%. Double downs aren't allowed after splits. If you start off with two 7s and have a hand of 14, you might split your 7s and get a 3 and a 4. That means your hands now total 10 and 11, respectively. 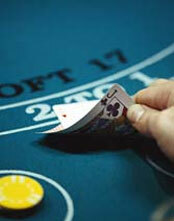 Well, in games with regular blackjack odds, players will choose double downs for both hands. With this rule, however, you will be cut off from possibly profitable options. 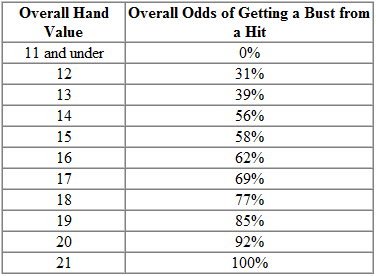 With this basic odds chart, you can start practicing with games of free blackjack and once you memorize these odds, you can even start testing your luck on actual cash tables. Have fun and good luck!